The software industry took off in the 80’s. Individuals made fortunes and national economies grew stronger because of their software exports. The focus on developing resources and building capacity around software development has created thousands of new jobs in countries that are ahead in the technology arena. Pakistan, despite its vast human capital, could not benefit from the humongous growth of the software sector and didn’t capitalise on the potential. Many factors have contributed to the current situation; lack of vision, proper leadership or will to move forward ­– but the fact of the matter is that while the situation has improved in the last few years, software exports only make less than 5% of the total exports. Other than the state of security and political instability in the country; a major reason we do not get any sizeable chunk of the multi-billion dollar offshore software development industry is the impression that we are not mature enough to take on big projects. We are stuck in a vicious cycle where we don’t get bigger projects because we are not a mature market and we are not provided with the opportunity to mature because we are not awarded bigger projects. The new era of technology has prospered the growth of start-ups in Pakistan but building a team that can do ground-breaking work is still a real challenge. While one can find good developers to build an app, however, for anything serious, the state of affairs is abysmal. I once had the pleasure of meeting a young man, about 25 years of age, at a major open source summit in Tokyo a couple of years back. Hailing from our neighbouring country, he was one of the core contributors to an open source project that was the subject of the conference. He was appointed to review the software code which others had submitted and to evaluate it for quality and content. This took me by surprise. A guy who could barely speak English was playing such a significant part in what was a high-level conference. I got the chance to have dinner with him later and asked him where it all began. His response was an eye-opener. He said back in his country, they have this culture of contributing to open source projects right from the time they start university. By the time they graduate, they are already well-established in the community. I don’t know if that happens only in select universities, but that’s the kind of vision which could usher in the change we so desperately need in Pakistan. Because Pakistan has a lot of catching up to do in software development. Open source is a major pillar of software development. The term ‘open source’ refers to a piece of software that is collectively built and maintained by a community compared to a software built by an organisation with exclusive access to its software code (also known as proprietary or closed source). However, open source is more than free software and code. It not only gives everyone access to the actual software code but allows them to modify it if they want to develop it further. The term originated in the context of software development to designate a specific approach to creating computer programs. Today, however, open source designates a broader set of values – what we call ‘the open source way’. A good example would be Wikipedia versus Encyclopaedia Britannica. Where Encyclopaedia Britannica is published by a company hiring hundreds of editors and contributors and can only be accessed if you buy it from the company that produces it, Wikipedia, on the other hand, is a free encyclopaedia, written collaboratively by the people who use it. Many people are constantly improving Wikipedia, making thousands of changes per hour. This collaborative effort – to create something that can be used by all – is called ‘the open source way’. But the question is, how can open source be our saviour? Open source software is a fast-growing aspect of the software industry. 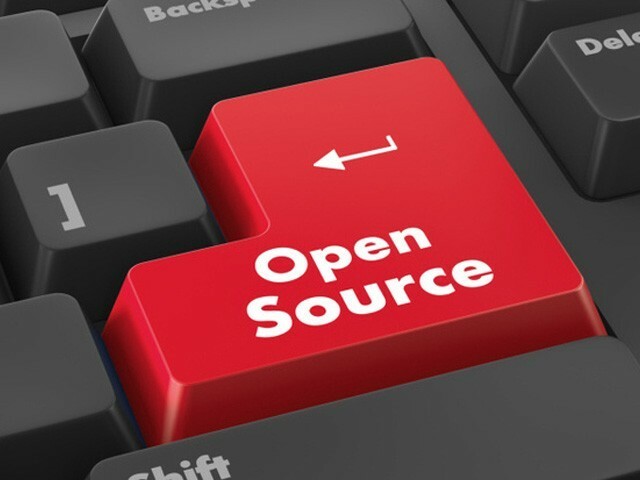 Although most of the open source software is low cost – even free – its popularity is largely based not on cost but on the ability to access and manipulate the software internals. This ability enables great flexibility, allowing organisations to easily build upon a base as opposed to relying on a single company for any enhancements (closed source). The software industry today is facing common challenges and open source is the answer to solving these challenges collectively. All the major tech companies are investing heavily by supporting open source development in order to allow the industry to solve the bigger challenges faster and more efficiently. All the major companies such as Google, Netflix, Uber, AT&T, Verizon and more, that spend billions on software, are now extensively involved in and driving the technology vendors to provide open source solutions because they don’t want to get locked down to a closed solution. Any technology vendor can take a copy of the software to make improvements but they have to push all the enhancements back to the community to remain aligned with the core project. This has created an ecosystem where there is a big demand being generated for programmers who understand open source and can contribute to it. Getting involved in open source helps improve the programming skills, widens the horizons and brings maturity to the thinking process and credibility. Whatever work an individual contributes is tested and evaluated at the highest standards, thus providing an opportunity to improve and learn. This also helps improve the confidence to take on bigger challenges and solving problems at a much higher scale. Every open source project has its own code of ethics and etiquette that defines how to get involved, which demands the individual to learn how to properly work in a team, how to voice their opinions, rally their concerns and work together for a bigger objective. This is the easiest way to showcase one’s abilities and technical skills at the global level without spending a dime. You do spend time, but you get much more than money out of it. As discussed earlier, the perception of Pakistan is an immature market for software development. The only solution to breaking this cycle is getting involved in open source and establishing ourselves to a level where we can be taken seriously. There are no limiting factors here, in fact, everyone is encouraged to get involved in these projects, because let’s be honest, who doesn’t love free resources. In fact, now with so much focus on open source, a lot of software business is being generated by the open source itself. A much-needed shift in the mindset is required for acquiring knowledge and sharing it as well. How can we achieve it, is a discussion for a later time, but realising there is a problem is the first step towards a cure. The countries who lead innovation do so by exploring new horizons and developing a culture where knowledge is shared freely. Pakistanis are very forthcoming when it comes to a charitable cause involving monetary contributions. Apart from major initiatives such as Edhi, and numerous other major names, Pakistanis have always opened their hearts and wallets when needed. But the selfless attitude stops when it comes to knowledge. In Pakistan, there exists a very rudimentary culture of sharing knowledge and giving back to the community as far as expertise and actual work are concerned. The general mindset is to confine yourself to a certain trade or technology and hoard knowledge thus, completely stopping the evolution and growth, both in the skill set and the mindset. We do have good schools and universities in Pakistan. If the change needs to be brought, the culture needs to change. Pakistan Engineering Council and Higher Education Commission can incentivise academics to encourage student participation in open source projects by directing students to take on tasks from the open community instead of doing their own projects. With all the help and documentation available, it is very easy to get involved in an open source project or to make open source our own intellectual property. It is not a lengthy process that requires any complicated legal affairs; instead, it is a very straightforward one. We have missed many opportunities but this one is too big to miss out on. The world is changing and, in order to survive and thrive, we must change with it. I hope and pray that we can gather enough momentum that we are able to make Pakistan a synonym for open source in next five to 10 years, like China is for manufacturing. The author is a serial entrepreneur and is recognised as a thought leader in the industry. He is currently striving to introduce Open-source culture in Pakistan by bringing academia and the industry together. A bit off-topic but relevant. The author should be well aware that a lot of Pakistani software engineers work closely with Indian software companies and programmers. There is no ban on cross-border IT collaboration for now. It is similar to Indians and Pakistanis living happily together in UK, USA etc., without any made-up hate. A small chunk of what India has gained in software exports is also because of the support of Pakistani entrepreneurs and coders. I was outsourcing server management work to a data center management company based in Kerala back in 2002. And I’m nothing in front of these large software export giants. Careem for example, has a Pakistani founder but he has a large presence in India for its coding needs. He has a multi-billion dollar business that sends hundreds of millions to India for development work. Innovative and Thought provoking and more than that it needs serious action by the HEC and more importantly the Univerities themselves!! If one Open Source project at any level of a BS program, later is better, is made compulsory, we can achieve what you envision!! Software business owner here with an office in Pakistan. We are in s/w development business for > 8 years. IMO infrastructure is the biggest problem for small businesses. Most of the businesses have to start small, and things like power outages, poor internet connectivity, etc consume so much energy. Also, institutions are throwing graduates out with no knowledge of the industry or how formal software development is done. Kids have masters degree in computer science but have no idea what an IDE or a project is. They expect industry to teach it all. one needs open-heart and open-mind to contribute to open-source knowledge.